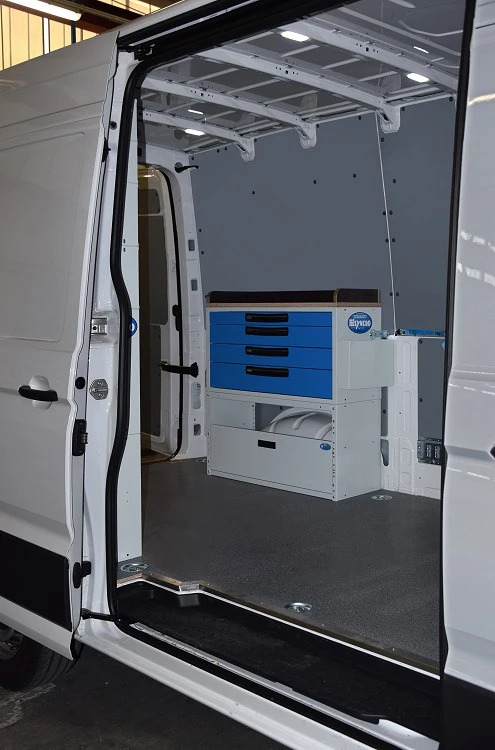 Find out how Syncro System converted a Crafter into a perfect mobile workshop for transporting and installing woodworking machines. The large Volkswagen Crafter van is now in its third generation. The latest model is actually the first to be manufactured directly by Volkswagen in a purpose-built factory in Poland, marking the end of a longstanding agreement with Mercedes. The Crafter is the most modern vehicle in the large van segment and offers the best solutions available from this class of commercial. The cargo space is generous and square in shape, with no protrusions to limit load capacity. 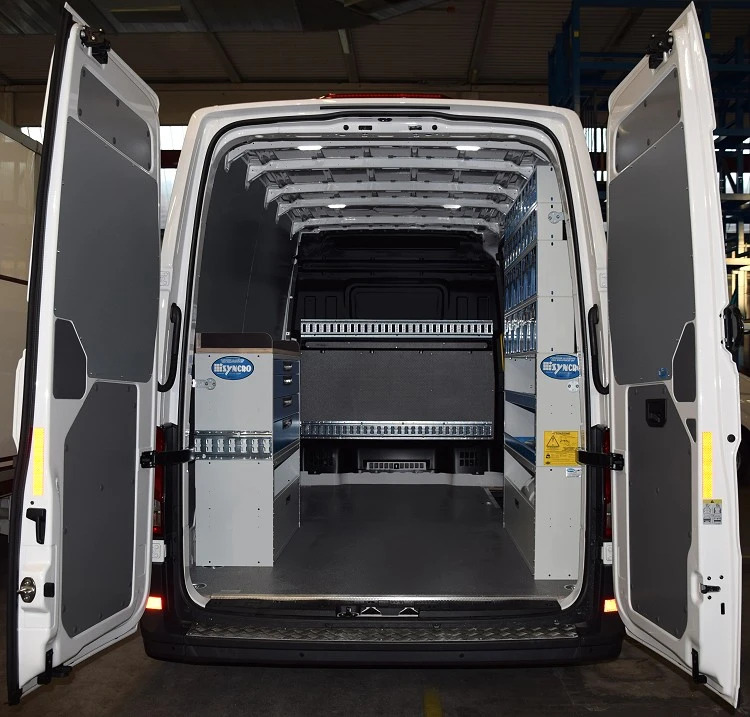 This makes the Crafter ideal not only for carrying goods but also for installing Syncro System racking and creating efficient mobile workshops for facilitating installation and service work in all areas of business. As always, Syncro System supplied model-specific liners and roof rack. 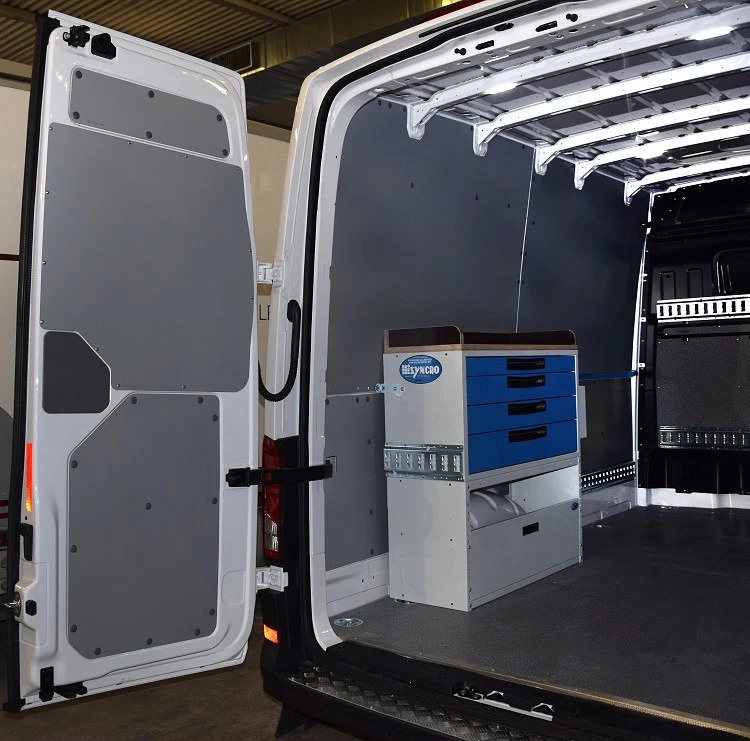 Syncro racking, of course, is completely modular and, like the many accessories in the Syncro catalogue, adapts easily to the shape of the Crafter’s load compartment. So let’s have a closer look at the racking in the Crafter illustrated on this page. This particular system was designed to meet the requirements of a company that sells, installs and services woodworking machines. The company naturally needed the Crafter’s racking system to leave plenty of room for carrying these machines along with all their accessories. 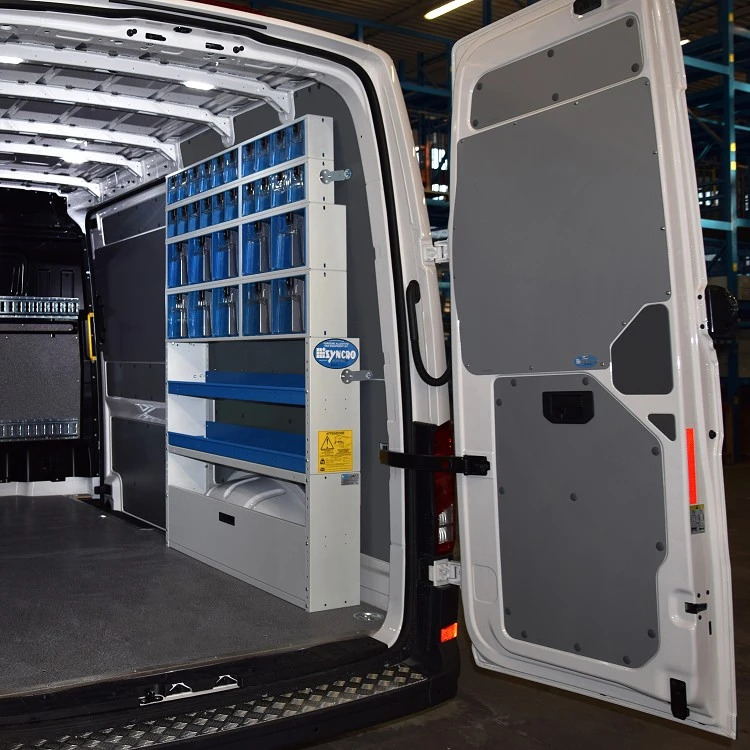 The first thing Syncro’s installers did was fit liners to protect the bodywork of the van’s load compartment. The floor was protected with a birch plywood liner with a marble-look surface, ideal for creating a perfectly flat load surface and protecting the original floor underneath. The marble-look finish makes the load compartment brighter and easy to clean too. Another marble-look liner was fitted to the bottom section of the bulkhead between the body and the cab. The walls and doors were protected with galvanised steel sheet panels painted in an attractive grey, a highly effective way to safeguard the body against damage caused by sliding or falling cargo. Moving on to the racking as such, on the left we can see, over the wheel, a column consisting of a wheel arch cabinet with a fully opening, lift-and-rotate door to create practical storage space. Further up is a drawer cabinet with four large metal drawers, all with non-slip mats, aluminium space dividers, automatic closing mechanisms and telescopic runners for easy opening. On top of the drawer cabinet, Syncro’s technicians installed a robust work bench in 25 mm thick, resin-coated birch plywood, complete with raised sides. A great solution for working inside the van! 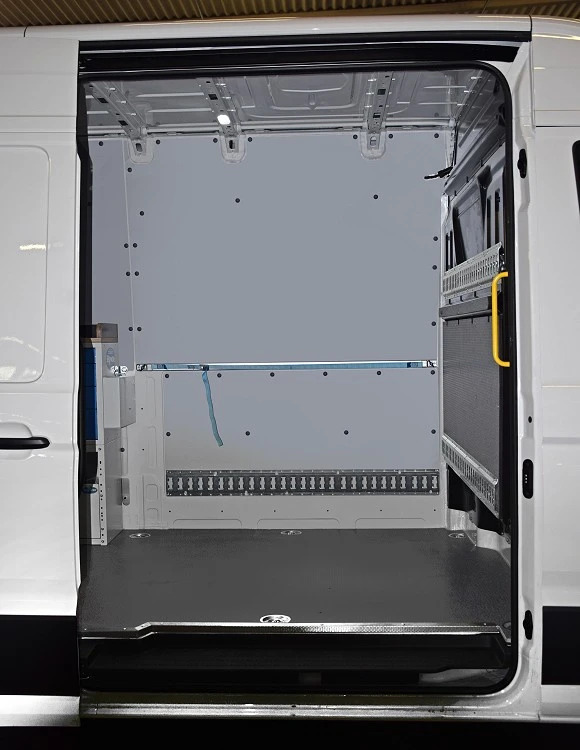 The racking on the right of the van consists of a wheel arch cabinet with a lift-and-rotate door and two large shelves with space dividers and mats. At the top of this column of racking is one of Syncro’s best selling products: cabinets of tilting, transparent containers made from the same top-quality plastic material as aircraft windows and with a patented design, automatic closing mechanisms and no protruding parts. Syncro’s tilting transparent containers represent the perfect way to store large quantities of small and medium size parts in a safe and orderly manner. Because they are transparent, these containers let you see immediately what’s inside. To secure heavy woodworking machines for transport, the customer asked Syncro to install four metal cargo rails for use with belts and tensioners with a 4000 kg load rating. On the van’s left side wall, the team also fitted an aluminium rail with a strap for lighter loads. A multi-purpose aluminium rack is fixed to the front side of the left racking.